Definition - What does Extended Hand-to-Big Toe Pose mean? Extended hand-to-big-toe pose is an intermediate balancing pose that strengthens the legs, improves balance and focuses awareness. From mountain pose, one knee is brought toward the chest. The corresponding thumb and forefinger reach down to wrap around the big toe. The lifted leg extends forward as the toes stay flexed. On an inhale, the lifted leg opens out to the side while the other hand stays on the corresponding hip. The gaze is turned, looking away from the lifted foot. 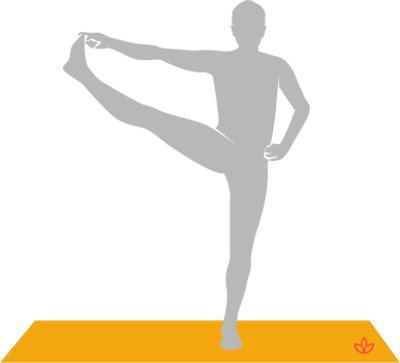 A beginner's variation of this pose is to keep the lifted knee bent and move the bent leg out to the side, with the hand either on the foot or on the top of the shin. Using a wall to maintain balance is also an option. Extended hand-to-big-toe pose may also be referred to by its Sanskrit name, utthita hasta padangusthasana. In order to stay in the pose for a couple of breaths, it helps to find and keep the drishti, or focal point, which for this pose can be anything you choose to focus on in front of you. It is also important to ensure that the standing leg, the pelvis and the torso all remain in mountain pose as the raising of the working leg often causes the remainder of the body to shift out of alignment.